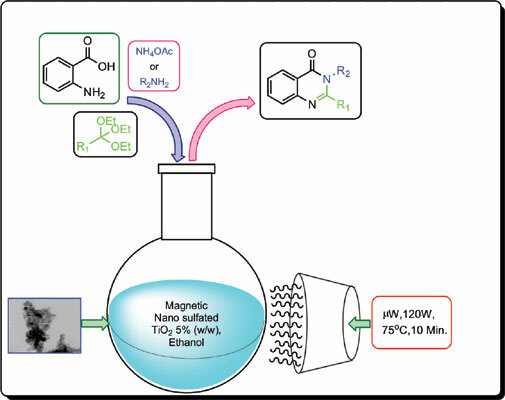 Intoduction: A highly efficient protocol for the one pot synthesis of 4(3H)-quinazolinones from anthranilic acid, ortho esters and various amines using a magnetically separable solid acid catalyst, nano sulfated TiO2 encapsulated Fe3O4 with microwave irradiation, is described. The plausible reaction mechanism for the synthesis of 4(3H)-quinazolinone, catalyzed by sulfated TiO2 encapsulated magnetic nanomaterial is also described. Conclusion: The developed process has been successfully applied for the synthesis of diverse 4(3H)- quinazolinones with variable functionality. This approach overcomes many of the drawbacks of the existing methods and provides an environmentally benign process. Magnetic nanoparticles, nano sulfated TiO2, solid acid catalyst, quinazolinone, microwave, amines.